September is National Honey Month. It’s a perfect time to whet our appetites for this useful-not to mention delicious-miracle of the bees. The picture below is a sampling of honey on hand at our house. 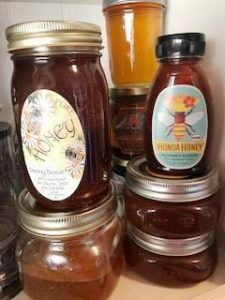 We love local honey, and are always interested in the honey from regions where we visit (or our friends bring home from their travels). National Honey Month is great timing for the fall harvest of honey around Arizona. Late October and November are when we look forward to cracking open our hive up north to see what we might take for ourselves, being sure to leave some for the bees to winter over. Besides being a natural sweetener, honey also has antiseptic and antibacterial properties. Honey is linked to wound-healing properties and antibacterial action. Topical honey treatment has been used to heal wounds and burns since ancient Egypt and has been used in medicine for over 5,000 years. It is rich in antioxidants, and may improve cholesterol levels. 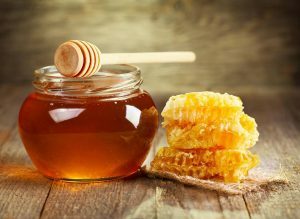 Add treatment of diabetic ulcers, and other skin conditions and cough suppressant to the list of uses for honey. Read more about these amazing health benefits of honey. When thinking about shelf life, tupelo honey wins top honors. This honey is produced when honeybees collect nectar from the blossoms of the white Ogeechee tupelo tree found in Florida and Georgia. Tupelo honey never crystallizes due to its high fructose to glucose ratio. Read more about the amazing shelf life of honey in this Smithsonian article. When bees find a nesting location, they immediately begin to produce honey. In fact, they are heavy laden with bellies full when they arrive. We are often asked to leave honey behind when we remove bees. In the case of live swarm removal, the bees have very recently arrived, and there has not been adequate time to produce enough honey to harvest. It is a well-established hive that provides capped honey that beekeepers harvest. Harvesting honey is a somewhat complicated task, and very messy. We recommend you find a good local source such as a farmer’s market for pure, raw honey-our favorite sweetener!